I was taking a break from packing tonight and my action loving hubby being out with his bros, I decided to see what Netflix had available on instant streaming. I enjoyed Three Coins in the Fountain so much last week; I was up for another classic chick flick. Emma fit the bill beautifully. 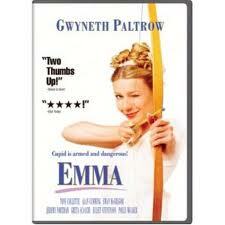 Based on Jane Austen's Emma, I'd forgotten how adorable and funny the movie is. I don't think it was wildly successful at the time but I liked it. Shot way back in 1996, Gwyneth Paltrow was girlishly fetching (the character is 22) - she actually had a bit of a protruding mouth and a hint of a lisp which had me wondering whether she's had dental work. In any case, I really enjoyed watching Emma continually play the matchmaker to little success. After all too easily persuading Toni Collette's self-conscious and silly Miss Harriet Smith that the farmer who loves her isn't good enough for her, Emma tries to get her matched up with a series of men all the while falling in love herself and being the last one to know it. Collette is ALWAYS good, isn't she? So natural and real, less than perfect teeth and all. LOVE her! Jeremy Northam is Mr. Knightly who frankly bears a striking resemblance to Austen's Mr. Darcy - there is something about men that show restraint that Austen was really really attracted to. Sophie Thompson's is heartbreaking in the small but key role of Miss Bates. In fact when Emma takes her own hurt out on the foolish but kind Miss Bates, we feel hurt for the poor simple woman ourselves. But it is Mr. Knightly's distaste for Emma's behavior and his passionate outburst that brings Emma to tears and confirms what we knew all along; it's Mr. Knightly's opinion and feelings that Emma cares about. Northam was Sir Thomas More in The Tudors; he seems like one of those underrated actors who will never quite hit the stratosphere. On the other hand the years have been good to Ewan McGregor who is nice and smarmy as the new boy in town - especially in his show-offy duet with Emma. When he then takes up with Miss Fairfax, we feel for Emma as if it were a slap in the face. Of course, alls well that ends well. All the men and women end up with exactly who they should end up with. The movie is a light, frothy romp which had all its characters playing their parts as expected. And for me, on this night, that was a good thing. Thank you Ms. Austen, for your fascination with the marriage plot.